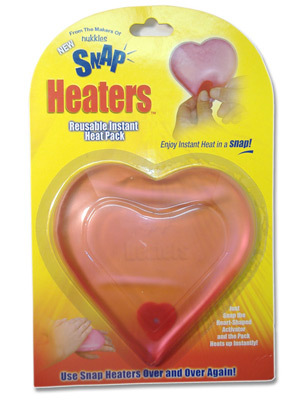 Snap Heaters- Instantly heats up in seconds. Enjoy Instant Heat in a SNAP! These instant heaters can be beneficial to provide warmth to the breast prior to pumping to facilitate the milk ejection reflex, or provide comfort during mastitis. The heaters can be reused! To reuse: Place crystallized Snap Heater in pot of boiling water. Wait a few minutes until all crystals have completely liquefied, then carefully remove Snap Heater from water using tongs or wooden spoon.